Home Stop Internet Plagiarism Your Copyrights Online 1. What is a Copyright? These are your rights and your rights alone. Unless you willingly give them up (EX: A Creative Commons License), no one can violate them legally. This means that, unless you say otherwise, no one can perform a piece written by you or make copies of it, even with attribution, unless you give the OK.
Inversely, if you’re looking for material to use or reuse, you should not do any of these things without either asking permission or confirming that the work is in the public domainaaezqzywrdfzafexsbacvtraasccfaawrzs, which means that the copyright has expired and all of the above rights have been forfeited. Simply put, if the work isn’t in the public domain and you don’t have permission to use a piece, you put yourself in risk of legal action, regardless of your intentions. Because, beyond fair use and parody (issues for later essays), the holder of a copyrighted piece has near carte blanche to do what they want with their work. It’s no different than owning a car, a house or a pen. One can lend it out to a friend, sell it, modify it or even destroy it. In short, if you own the copyright to something, you have the same rights that you do with anything else and, in some instances, even more. After all, you did create it. It only makes sense that you would own the fruits of your labor. That’s what copyright law is all about. Though moral rights are not currently recognized in the United States, they’re a major element of European copyright law and are becoming increasingly important as the Web becomes more globalized. Moral rights are a set of rights that are separate from the author’s copyright on a piece. These rights are generally considered inalienable, which means that they can not be given away or sold, and thus persist even if the copyright to a work is completely sold. It is easy to see how moral rights can be useful in fighting plagiarism since such an act is not only a violation of the author’s copyright, if he or she holds it, but also the moral rights. 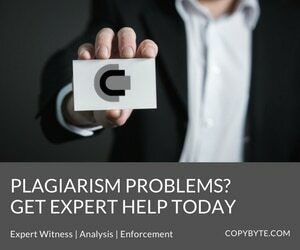 It may also be useful in cases where the copyright of a work has been lost, either sold or given away, but plagiarism continues.